I was really interested to watch “Tomorrowland”. I don’t get the reasoning behind creating movies about amusement park rides (or, in this case, whole sections of theme parks), but what little had been revealed in the trailer looked promising. I’m not a fan of George Clooney, and he was the only big name in the film. Considering how poorly Tomorrowland did at the box office, and how terrible “The Haunted Mansion” was, I had low expectations. The film began with the tired old “telling the story as a flashback” trope, though without revealing much. A fairly good opening segment set in the sixties, which wasn’t hinted at in the trailer, followed, setting up part of the science fiction premise. The film then flash forwarded to modern day, where Casey (Britt Robertson from “Under the Dome”) finds a mysterious badge which, when she touches it, transports her to the magical Tomorrowland. The remainder of the film falls flatter and flatter. 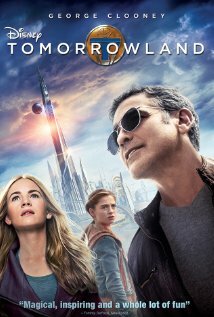 Robertson and Clooney wade through action sequences and plot developments, supported by Raffey Cassidy and Hugh Laurie, but ultimately, the revealed Tomorrowland is a two dimensional, elitist utopia, and the solution to all our world’s problems is a quick fix, once the brilliant heroine guesses what the problem is. It’s all a little too easy. Sorry, Brad, but you should have spent more time on the script before rolling the cameras on this one. This entry was posted in movies and tagged britt roberson, george clooney, hugh laurie, movie, raffey cassidy, review, science fiction, tomorrowland, under the dome. Bookmark the permalink.